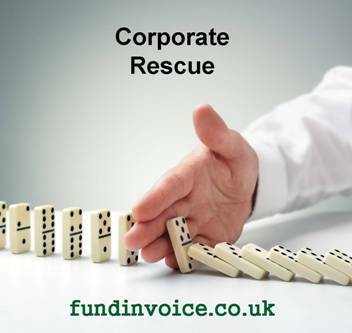 If you are searching for help with corporate rescue you might be interested in an alternative option to raise money, that does not involve insolvency. If your business is being overwhelmed with debt that you owe, you may have been considering options like speaking to an insolvency practitioner about various forms of insolvency such as Administration, receivership, Creditors Voluntary Arrangements (CVA) etc. You may be in control of this process i.e. actively seeking help yourself, or a creditor may have taken control and issues proceedings e.g. a winding up petition, against you. Whatever the situation, there may be other alternatives to insolvency, that could rescue your company as a going concern. Avoiding insolvency is often a strong motivation is difficult situations where you have pressing creditors. Going down the formal insolvency route can have repercussions on your future so many people look for alternatives to insolvency. HMRC pressure for tax payments e.g. corporation tax, VAT or PAYE and National Insurance. As mentioned above, it is often just a case of needing to raise enough money to get your business out of its current situation. There is a way to do that, in some cases, even if your business does not have a great credit history or strong financial accounts. If you have a debt ledger of outstanding sales invoices, on credit terms, to business customers, you may be able to use that as security to release enough cash to overcome your money problems. The solution is called debt factoring, and it uses your unpaid customer invoices for a significant advance of cash. This could be 80/85% of the value of the outstanding debts and you can use this money for any purpose. When your invoices are paid, it repays the cash advance. The good thing about factoring is that it does not take much account of your financial situation and your credit history. This means that if you are in financial trouble, have been for a while and have built up some defaults or even court judgements, you are still likely to qualify for factoring. This is because eligibility is based on the strength of your debtors rather than you company. Someone recently said to me that if you go to a bank you have one chance of getting funded, based on your company strength. If you have 20 customers and go to a factoring company you have 20 chances of getting funded, based on the strength of your 20 customers. Even if single customers are not that strong, a factoring company will often overlook that as they are more concerned about you having a good spread of customers, hence a spread of risk for them. If one doesn't pay, the others are likely to pay and repay the advance that way. Why not call us and have a conversation about the options in confidence? We won't tell anyone about your situation, unless you instruct us too, and we are not going to start running credit searches against you. We will just talk through your circumstances, and see if we can enable you to use the hidden assets of your company to solve your creditor problems. We have stopped other companies from having to close down, this is a recent case study about a recruiter that avoided closing down by using our service. You can call us on: 03330 113622 and we may be able to save you from insolvency proceedings with a corporate rescue.